Posted August 16, 2017 & filed under Rental. The forklift truck is a highly efficient machine used in many industries for the lifting and moving of heavy loads. There are 3 ways a company can acquire a forklift: buy, lease, or rent. Depending on your business needs, owning or leasing a forklift may not be an ideal solution. While generally the more expensive of the 3 ways of acquiring a forklift, renting a forklift often will be the most flexible and economic solution for your business. In today’s fast paced business environment, many companies recognize the many competitive advantages found in renting a forklift. If you are interested in renting a forklift, call your local Toyota dealership. Be sure to discuss your Material Handling application needs with our Rental Fleet professional to choose the right forklift for your business requirements. And often have it delivered the same day to your facility. Want to know more about rentals? Contact Allied Toyota Lift today. Posted July 18, 2017 & filed under Toyota Value Proposition. When you’re considering various brands of forklifts, you’ll likely consider four key factors: quality, durability, reliability and value. All four of these factors are necessary to make the best investment decision. Toyota forklifts are manufactured with the highest attention to detail, using the highest quality parts made by Toyota. If an issue arises while a Toyota forklift is being manufactured, the entire line stops at once and waits for the issue to be resolved before moving on. You would be hard pressed to find a manufacturer that demands the same attention to detail. Are your day’s long? Are your forklifts a lifeline for your job? 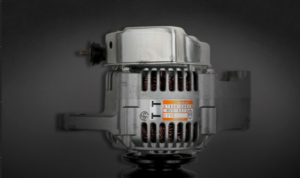 You need something that’s dependable and that can last. Toyota has been ranked as the most durable forklift available by forklift purchasers for 10 years in a row. At Toyota, we understand that you need your forklift to work when you have a job to do. We respect that. Toyota forklifts are proven to offer more up time than any competitor. 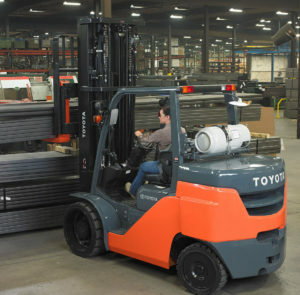 When you’re comparing forklifts, you’ll notice Toyota is not the cheapest option up front. 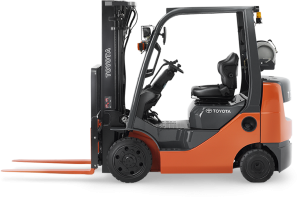 However, the real value of a forklift is limiting long-term costs, and that’s where Toyota excels. A Toyota forklift is made with high-quality parts and highly trained workers, which decreases downtime and adds to the value of your forklift. If you look at these four factors – quality, durability, reliability and value – there’s no question that Toyota is the smart choice. With proper care, your Toyota forklifts will be strong assets for years to come. You may choose to take advantage of industry-leading residuals with a Toyota Industries Commercial Finance (TICF) lease or you may decide that purchasing a new forklift is best for you because you plan on using it indefinitely. Both long and short-term rentals provide needed solutions to thousands of forklift customers across North America each year, particularly during peak seasons. A trusted Toyota Certified Technician is never more than a phone call away and your Toyota forklift dealer is one of the best in the business. From production using the world-renowned Toyota Production System to delivery through Toyota’s own Delivery Experience program to lifetime use, Toyota is interested in you, your business and your needs. Toyota is value and we want to be your partner for life. As you can see, the Toyota total value story is unique only to Toyota. Toyota forklifts are manufactured to perform, to be reliable and durable and to be a long-term value for you and your business. Now that’s a story of total value — total value that lasts. Need help choosing the right forklift? Find the right forklift for your needs here. We’d be happy to talk to you about what makes Toyota a good choice. Contact Allied Toyota Lift today. Why Use Toyota Genuine Parts? Posted June 27, 2017 & filed under Parts. Keep your Toyota a real Toyota. Toyota’s aftermarket quality control system makes certain that every Toyota component is constructed to the same tolerances and strict quality control standards as the part it replaces. To achieve optimum performance and maximum trade-in value for your investment, keep your Toyota a real Toyota with Toyota Genuine Parts. 1 You’ll get a longer warranty. Toyota Genuine Parts warranties are one-year vs. six months with a non-genuine part. Plus, if you have a Toyota Genuine Part fail during that time and a Toyota Certified Technician installed it for you, we’ll pay for the parts and labor. That’s right, labor is covered! 2 You know you’re getting the same great quality. If you use Toyota Genuine Parts on your forklift for no other reason, do it because you know the quality is just as high as that Toyota you researched and purchased. 3 Your forklift was made using them. 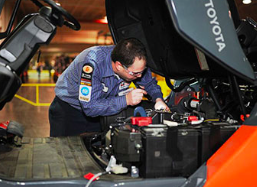 4 The technicians working on your forklift are trained to work on Toyota Genuine Parts. 5 Not using them can cost you in the long run. Though generic or “will-fit” parts are less expensive on the front end, only Toyota Genuine Parts are engineered to keep your Toyota forklifts running longer and more efficiently, decreasing downtime and constant replacements. Will-fit parts are generally manufactured to lessor standards and will fail prematurely requiring replacement twice as often as Genuine Toyota Parts. With labor cost so expensive in any repair invoice no business can afford that extra expense. And the extra downtime is very expensive. When you purchase a Toyota forklift, you purchase from the world’s top selling brand. For 10 years in a row, forklift buyers have named Toyota forklifts the best in quality, durability, reliability and overall value. Toyota forklifts come off the manufacturing line packed full of Toyota Genuine Parts. Toyota Genuine Parts are the core of Toyota forklifts and the reason for their high quality, extreme durability, mind-at-ease reliability and financially-friendly best overall value. Every time you use a generic, will-fit part, you take away a little bit of what makes a Toyota forklift a real Toyota. To keep your forklift running as efficiently as possible, only use Toyota Genuine Parts from your local Toyota forklift dealer. You bought your Toyota forklift for a reason. You know the brand and you know Toyota’s reputation for performance. Toyota Genuine Parts are made with the exact same care, quality materials and attention to detail as the forklifts are. Our forklifts are made with Toyota Genuine Parts! Interested in parts or service for your material handling needs? Have a question you’d like answered? Contact Allied Toyota Lift today. Posted May 8, 2017 & filed under Aerial Lifts. 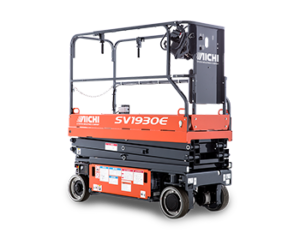 The five models of the AICHI E-Series Scissor Lift offer working heights of 25, 26, 32, and 38 feet. Working height is calculated by adding six feet to platform extended height. The versatile offerings can be maneuvered through your facilities to reach up and across obstacles. es of the Aichi Scissor Lift help meet operators’ safety needs. Pothole protectors reduce ground clearance of the scissor lift and limit unwanted movement if the vehicle is driven into a hole while the platform is elevated. An anti-rollback function keeps the lift in place if stopped on a ramp, and controlled descent automatically slows the unit down when travelling down a grade. Upper control box: Flexible operation controls offers to two mounting positions or remote use while off of the scissor lift. Aerial Lift Safety Training classes are required by OSHA every 2 years. Aerial Lift Safety Inspections are required by OSHA on an annual basis. Allied Toyota Lift is certified to conduct and certify OSHA training as well as make annual aerial lift inspections. Want to know more? Contact Allied Toyota Lift today for more information on pricing and features. When should you replace your forklift tires? Here’s what to look for. Posted March 15, 2017 & filed under Forklift Tires. Thousands of dollars ride on your choice of industrial tires. 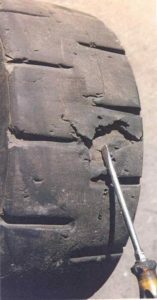 Why risk expensive downtime, equipment damage, or even employee injuries riding on worn-out or damaged tires? Here’s a few issues to watch for. Most press-on tires with normal wear should be replaced when the tire surface reaches the top of the letters on the sidewall. Before starting to diagnosis your tire issues, ask yourself these questions. Load, with maximum payload & empty? Speed, with maximum payload & empty? Indoor/outdoor use and surface conditions? One side of truck? Both sides? Your tires can wear in many different ways indicating different usage problems. Which bucket does your equipment fall in? Overload. 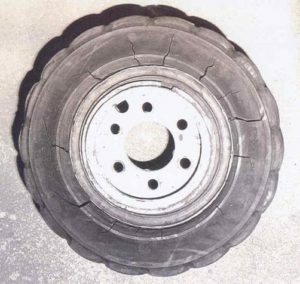 Loads exceeding the rated capability of the tire. Check the baseband. Look for a point of impact. When “some” rubber is left on the band, it’s usually caused by heat/weight, not bond failure. If it’s “clean”, it’s a bond failure. Littered or rough floors, other surfaces such as gravel, asphalt, etc. 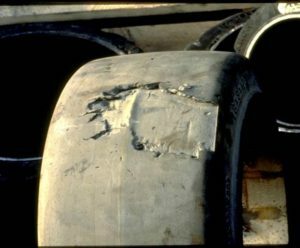 Questions about your forklift tires? Contact Allied Toyota Lift today.